Puerto Rico is home to gorgeous beaches, a lush rainforest, a lively music scene, hospitable people and delicious food. This Caribbean island’s cuisine is a unique fusion of ingredients, cultures, and recipes. Puerto Rican cooking is often compared to Spanish, Cuban and Mexican cuisine. However, it is a distinctive blend of the cooking traditions of Africa, the United States, Spain, and the native Taínos. Locally, Puerto Rican cuisine is known cocina criolla, which translates to Creole cooking or Caribbean cooking. Savour mouthwatering dishes such as Mofongo (mashed plantain), Arroz Con Dulce (sweet sticky rice), Arroz Con Gandules (rice with pigeon peas, vegetables, and meat), Mallorca (Puerto Rican croissant), and more on your trip to Puerto Rico! Here, we list the seven best local dishes that are unique to Puerto Rican cooking and are worth a try. You can’t have a more Puerto Rican breakfast than a traditional pastry known as Mallorca accompanied with some delicious Puerto Rican coffee. Mallorca is described as a Puerto Rican croissant or a brioche and is a delectable, moist, buttery, coiled bun. Traditionally, a Mallorca is cut in two, buttered up and pressed flat between the hot steel plates of a griddle, and served plain with powdered sugar or with egg, ham, and cheese. 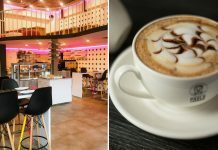 In San Juan, Puerto Rico’s capital, Cafeteria Mallorca is a popular restaurant serving the most mouthwatering, melt-in-your-mouth Mallorca. Mofongo is the staple dish of Puerto Rico and the unofficial king of Puerto Rican cuisine. 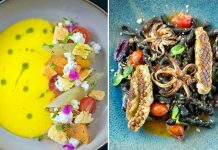 It is served at almost every Puerto Rican restaurant, from roadside shacks to some of the island’s most sophisticated restaurants. Each eatery has their own version of Mofongo, however, what stays the same is the main ingredient of fried green plantains. These plantains are mashed into a tight ball along with salt, garlic, and oil. Delicious fillings such as vegetables, chicken, shrimp, pork, or octopus are added inside and around the plantain ball. If you try only one native Puerto Rican dish, this should be it! Arroz Con Dulce, a traditional Puerto Rican dessert literally translates to “rice with sweet” or “sweet rice.” This creamy, sugary and tasty dessert is served all year round in Puerto Rico. It is especially made during Christmas and the holiday season. 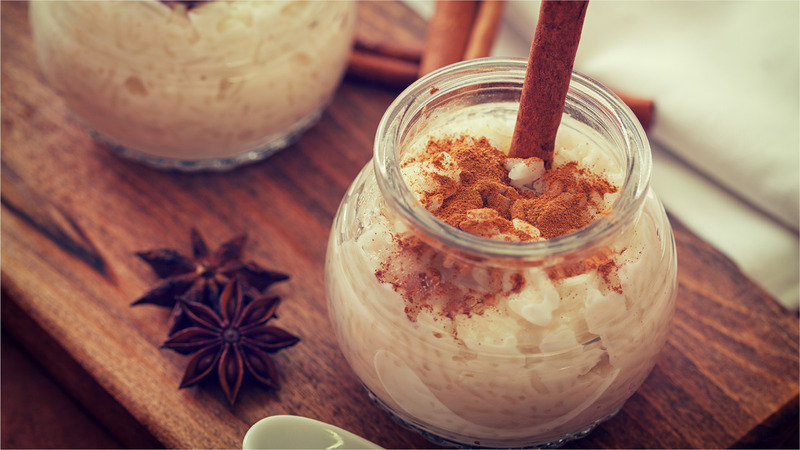 It is a flavourful coconut sticky rice pudding cooked with raisins, cinnamon, nutmeg, ginger and cloves. Another variation of Arroz Con Dulce is with orange extract and dried cranberries. This appetising dessert is often topped with cinnamon sticks and raisins. Arroz Con Gandules is another staple to Puerto Rican cuisine. It is a lip-smacking white rice dish typically cooked with pigeon peas, a special sauce known as sofrito (made with cilantro, onions, peppers, and tomatoes), ham, pork, chorizo, red peppers, and olives. This dish has Caribbean roots and is heavily inspired by Spanish cuisine. Arroz Con Gandules may also be cooked with seafood instead of meat, and even has a vegetarian version. The sofrito sauce is essential to this dish, and it gives the rice a unique and delightful flavour. Puerto Rican cuisine has some of the tastiest fried finger food in the world. Puerto Rican empanadillas are savoury fried pastries traditionally filled with ground beef. Now, chicken or cheese empanadillas are also served. Empanadillas are similar to empanadas, but they have a thicker outer crust. Additionally, alcapurrias are fritters made with yucca and plantains, and filled with meat or cheese. Street food stalls and local restaurants all over Puerto Rico serve a sampling of varied fried snacks that are lip smacking! Non-vegetarians should make their way to the northwest corner of the island, for the ultimate Puerto Rican traditional delicacy—Lechón. This dish is the island’s famous roasted suckling pig. In Puerto Rico, Lechón is more than food; it is a tradition. It is cooked for family gatherings, holidays and special occasions. There is even a road known as the Ruta del Lechón, which translates to Puerto Rico’s Pork Highway. This street is brimming with open-air, roadside local eateries known as “lechoneras” that serve Lechón. This dish is cooked over an open fire for eight hours, resulting in slow roasted pork, which is tender, juicy and scrumptious. Asopao is often described as a Puerto Rican version of stew. This aromatic savoury dish is made with rice, peppers, pigeon peas, olives, sofrito, choice of meat or seafood, and a variety of seasonings. While rice, vegetables, and sofrito are the constants; each Puerto Rican chef adds their own twist to the recipe of Asopao. In some restaurants, you may even customise your own Asopao by choosing your favourite ingredients and flavours.